Excuse us for bombarding you with Daddy A Cooks posts. It’s a long weekend and I’m feeling under the weather so the hubby took over homemaking duties. He cooked lots of yummy meals and snacks for us today, but the meal highlight of the day has got to be his Chicken Adobo Volcano! Adobo is A’s specialty. He cooks all kinds and continues to search for new versions he can try. This one’s my fave, though. It’s sweet and extra spicy — perfect for a momma who has a cold! 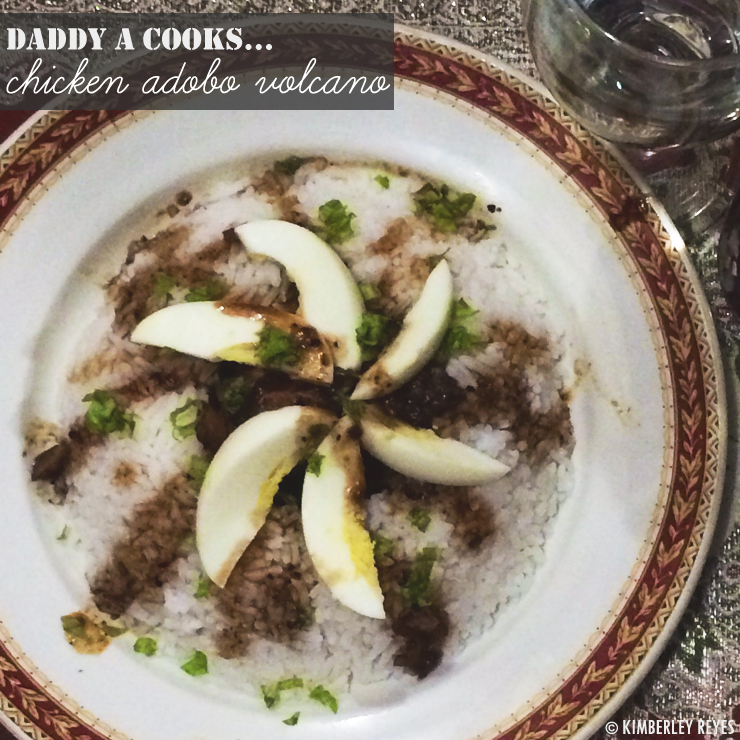 But it being spicy isn’t the only reason why he calls it “adobo volcano.” It may look like a huge pile of rice, but it is actually just a cup of rice with a hole in the middle like a volcano. Inside the hole are tender spicy chicken adobo bits. I love how the sauce overflows on the sides and topped with slices of boiled egg and lettuce strips. Corned Beef and Sunny-side Up Egg ala… Noah’s Ark?